As we study the Epistle of James keep in mind that James is Specificatlly addressing Jewish Christians (James 1:1) who because they are who they are model their behavior on the then existing Scriptures. James is using what they already know to instruct them on the true behavior that must be practiced and seen by those who are in the kingdom of God. James message is that true faith must and should reveal itself in the behavior of those who possess this faith without detailing the source of that faith. To do this the lesson focuses our attention on the meaning of the Good Samaritan account found in Luke 10:30-37 however we should back up a bit and include verses 25 through 29 to acquire the context. The lawyer then said; “You shall love the Lord your God with all your heart and with all your soul and with all your strength and with all your mind and your neighbor as yourself”. Jesus’ response at the point was to say; “You have answered correctly; do this and you will live”. The implication is that this is the one thing the lawyer was not doing. For our own understanding let’s review a related encounter where Jesus told the Pharisee named Nicodemus that you must be “born again” of the spirit to enter into the kingdom of God and have eternal life, John 3:1-21. By comparing these two biblical accounts of the teaching of Jesus we conclude that for us to ‘love our neighbor’ as Jesus was teaching the lawyer was not possible without first being ‘born again’ and led by the Holy Spirit. James, in his epistle, is simply telling Jewish Christians, those whose human spirits have been ‘born again’ by the indwelling Holy Spirit, that they are to openly display this kind of love that only comes by having a ‘born again’ relationship with God. As a Seventh-day Adventist there is a problem. You don’t maintain the biblical belief that you have a dead human spirit that needs to be ‘born again’ because you don’t have an understanding of what died on the day Adam and Eve sinned, Gen. 2:15-17. The theme for today is an excellent one, that of the divisive sin of partiality. It is directed towards but is not limited to a Christian’s relationship within the Body of Christ as outlined in James 2:1-4 and continues on through to verse 13. In verse eight it says; ‘You shall love your neighbor as yourself’. James is concerned with far more than what happens during a gathering of Christians during a time of worship. What is said in the lesson is good but ignores the many ways the ‘sin of partiality’ can and does occur within the Seventh-day Adventist denomination. In not understanding that Adam’s sin led to separation from God because of the death of the human spirit Adventist don’t understand that the basic need of all sinners is to be born again of their human spirit, Gen. 2:16-17 & John 3:1-8. In teaching doctrines that do not recognize how mankind was originally created in the image of God Adventist automatically have a unbiblical sense of superiority towards orthodox Christians whose human spirit have been born again of the Holy Spirit through acceptance of the pure simply Gospel,1 Cor. 15:1-5. The Adventist refusal to worship with born again Holy Spirit led Christians simply because of a different day of worship is an unwarranted form of partiality. Ultimately what defines a Christian has nothing to do with the human-devised organization they are a member of. This means many who are Seventh-day Adventist can be and truly are born-again believers who become aware that they have been gifted with certain gifts of the Holy Spirit. In 1 Cor. 12:1-13 we learn that it is the role of the Holy Spirit to personally lead all Christian Believers into an understanding of the Word of God. Ultimately this is not the biblical role of centralized church leadership outside of what Scripture teaches. Within Adventism there is great prejudice against anyone who sincerely questions Adventist doctrine even if it is nothing more than a case of wanting to understand and establish doctrine on the Bible and nothing but the Bible. When a born again Holy Spirit led person leaves Adventism on biblical grounds for orthodox Christianity it is very arrogant and prejudice to label that person as having left for reasons of apostasy when in fact the very opposite is true. It is an unwarranted assumption to label a person as an apostate without objectively examining their reasons for leaving. In a study of the Epistle of James it is very clear that the world should be able to recognize that you are a Christian by the way you live and conduct your life. Righteous conduct, however, is the result of having been born-again of the Holy Spirit and is not what produces that ‘new birth’ in Jesus Christ. One of the great fallacies of Adventism is to look down upon the sins of a person if it happens to be such things as smoking or an addiction to alcohol not understanding that in reality all Christians still sin even if it is not the big ones Adventist focus on, 1 John 1:8. To demand that you must overcome these certain sins before can join the Adventist denomination and then be considered a Christian defies the teaching of Scripture. It discriminates against a person for appearances only. In James 2:1-4 the sin of partiality was introduced through the example of giving more recognition and prestige to the rich and well-dressed versus the poor and shabbily clothed person. In verses five through seven James gives a compelling argument why godly people should be doing something much different. The lesson makes some good points concerning the conflict between the rich and powerful and those who have no such influence or power. It should be pointed out that this whole concept of ‘class struggle’ is a worldly system of governing ourselves without acknowledging God and his Son Jesus Christ as the Lord and Savior of our lives. James is making the point that Christians are intended to be guided by the indwelling Holy Spirit and the “Royal Law”. They must live with a whole different focus. This being the faith the world should be able to see by the way we live. Look around and you will notice that it isn’t just the rich who are guilty of this sin. We should recognize that we all are born sinners and have a tendency to covet what others have, whether it be riches, possessions or power over others. While James doesn’t clearly articulate the difference between living under the New Covenant commands of Jesus versus the Old Covenant Mosaic Law, when you compare the James passage with Matt. 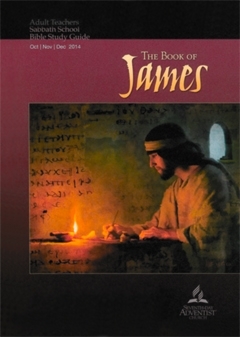 5:43-48 & Romans 7:1-6, you see that James understands and agrees with what the Apostle Paul was preaching and teaching. The unwritten law of the Holy Spirit, Rom. 8:1-11, is much more significant and meaningful than anything contained within the Old Covenant. Notice that the ‘whole law’ means everything contained in that law, not just certain biblically undefined portions of that law. James very clearly says that whoever attempts to keep the whole law, meaning all of the Old Covenant Mosaic Law, but fails on even one point is a transgressor of the whole law. Jesus spoke of a New Covenant replacing the Old. The written Mosaic Laws were established through the ratification of the Old Covenant at Saini. The requirements, including all the written laws, of the Old Covenant were fulfilled by Jesus Christ at Calvary. All the requirements of the Old Covenant law, not just the ceremonial laws, were fulfilled by Jesus. The law and commandments of God that Christians are to live by are outlined in Romans chapter eight. Under what James calls “the law of liberty” he declares that “mercy triumphs over judgment”. For Adventists that take time to meditate upon the consequences of what they believe this opening lesson statement should present an unresolvable conundrum. How do you reconcile that Christians are declared justified and called righteous by faith in the blood of Jesus Christ shed at Calvary on the one hand yet at the same time maintain belief in the doctrine of Investigative Judgment before you can know if you are to be admitted into the kingdom of God? • Christians are dead to the Old Covenant Law and are not judged by law they are dead to. In Romans 7:1-3 the Apostle Paul establishes the legal tenet that when one party to a contract, in this case those who had been covered under the Old Covenant, then the requirements of that covenant are no longer binding. • The judgment of our good works we have been created by God to do is about rewards, not salvation. Our works that will stand the test of fire are only those works which are founded upon the Christian foundation of faith which is the pure simple gospel message of Jesus Christ. This is a critical reason you must not add to or take away from the gospel as there is only one gospel that leads to eternal life, Gal. 1:9. As is the typical practice today’s lesson is centered solely upon Ellen White quotes with virtually no recourse to what Scripture actually teaches. For our commentary we will respond to what is asked in one of the discussion questions by pointing out how it is Adventist doctrinal beliefs which “are contrary to the principles of the biblical faith”. Adventism claims that Jesus’ life here on earth was to vindicate the character of God. Notice however how God makes the point that not even Job (whom God calls “a blameless and upright man” when speaking to Satan) can challenge the actions or character of God. Read and study Job, especially chapter 38 to the end of the book. God does not vindicate himself to anyone or anything that he has created. It is heresy to claim there are righteous beings somewhere in the universe who are watching to see if God will proof his actions as righteous. Adventism does not teach that sinners have a human spirit that died when Adam sinned and is why you must be born again before you can join the kingdom of God. Until you understand what died on the very day Adam sinned, Gen. 2:17, you will not understand the meaning of being “born again”. Adventism teaches that Sabbath Keeping will be the seal of salvation that determines who is a Christian in the End Times which is thought to be a time when Christians must endure without a mediator. However Scripture says none of this. Instead, know that it is another heresy to not teach that the indwelling of the Holy Spirit is the Seal of your salvation and that the Holy Spirit will never depart from you once you are sealed into the kingdom of God, Eph. 1:13-14, 2 Cor. 1:21-22 & Rom. 8:1-11. There is nothing that can separate you from the love of God. Adventism teaches the ultimate heresy that Satan is our Scapegoat. Notice however that on the Day of Atonement both goats had to be without blemish which could only have represented the perfect holiness of our Savior Jesus Christ. Therefore the one chosen ‘by lot’ to be the Scapegoat could not have represented Satan. Copyright 2014 BibleStudiesForAdventists.com. All rights reserved. Revised October 27, 2014. This website is published by Life Assurance Ministries, Camp Verde, Arizona, USA, the publisher of Proclamation! Magazine. Contact email: BibleStudiesForAdventists@gmail.com.